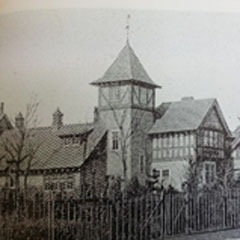 ‘The Bungalow’ was originally home to James Cossar Ewart (1851–1933), Regius Professor of Natural History at the University of Edinburgh between 1882 and 1927. Ewart commissioned the house in 1895 and also established a ‘Natural History Station’ on the premises, where he kept a menagerie of animals. Ewart’s most famous experiments were cross-breeding zebras and horses, the results of which were published in 1899 as The Penycuik Experiments. Ewart was later instrumental in founding the study of genetics at the University. 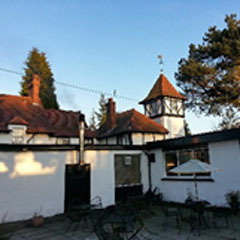 The Bungalow is now a hotel, as is Ewart’s later home, Craigybield, which is situated further down the road. 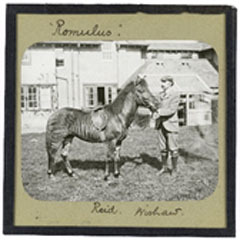 James Cossar Ewart with his zebra-horse hybrid Romulus, at the Bungalow, Penicuik, c.1899.